Greencore Food to Go says upgrading its domestic hot water system from two shell-and-tube calorifiers to a compact SPIRAX EasiHeat solution has enabled it to reduce its annual gas bill by £30,000. The EasiHeat steam-to-hot-water system provides crucial hot water for staff at the company’s production facility at Manton Wood in Worksop, Nottinghamshire. 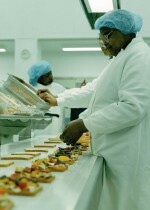 The site employs up to 2,000 people, who produce 3.5 million packs of handmade sandwiches, baguettes and wraps each week. Staff must adhere to a rigorous daily hand-washing regime, before they start work, after every break and every time they change from using one type of filling to another due to the risk cross-contamination poses to allergy sufferers. EasiHeat is based around a compact plate heat exchanger and provides instantaneous hot water at constant temperatures. Because it does not store water like a traditional shell-and-tube storage calorifier, which must store water at 60°C or higher to aid the prevention of Legionella growth, less energy is needed to heat the water. This enabled the Manton Wood site to reduce its annual gas bill by £30,000. Greencore Food to Go says it has included the EasiHeat in its 24-7 priority response service contract with Spirax Sarco. “Hand washing is crucial in a food factory and we have to ensure that hot water is available 24 hours a day, seven days a week,” explains Chris Bassett, services engineering manager at Greencore Food to Go.